Since 2002, the city of Dubai (capital of the United Arab Emirates) has seen an increase in private real estate investment in recreating Dubai’s skyline with projects as The Palm Islands, The World Islands and Burj Dubai. The Palm Islands is a series of artificial islands for the coast of Dubai on which major commercial and residential infrastructure will be constructed. To date, the islands are the largest land reclamation projects in the world and will result in the world’s largest artificial islands. Because the works are completely build in the ocean, who else but the Dutch are hired, for they one of the world’s specialists in land reclamation. The islands are The Palm Jumeirah, The Palm Jebel Ali and The Palm Deira. The first two islands will comprise approximately 100 million cubic meters of rock and sand. Palm Deira will be composed of approximately 1 billion cubic meters of rock and sand. The Palm Jumeirah consists of a trunk, a crown with 17 fronds, and a surrounding crescent island that forms an 11 kilometer-long breakwater. The island itself is 5 kilometers by 5 kilometers. It will add 78 kilometers to the Dubai coastline. The first phase of development on the Palm Jumeirah will create 4,000 residences with a combination of villas and apartments over the next 3 to 4 years. Between the three islands there will be over 100 luxury hotels, exclusive residential beach side villas and apartments, marinas, water theme parks, restaurants, shopping malls, sports facilities and health spas. This article is licensed under the GNU Free Documentation License. 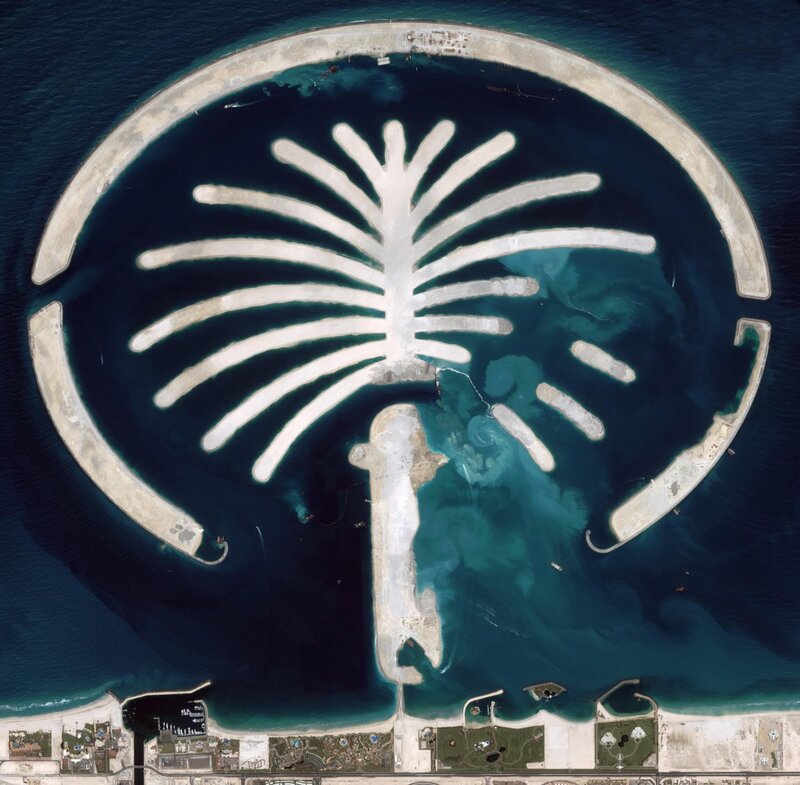 It uses material from the Wikipedia article “The Palm Islands“. « Why do whales get the bends?